One of the best and most notable features of Mont Bleu’s products is that they offer a large array of items that are exhibited with various designs and styles. The items they offer come in different sizes and shapes, and are also exquisitely embedded with Swarovski crystals. One of their most notable creations would be the glass nail file which we greatly love because of the appealing designs and styles they have; also, we consider this as one of the best glass nail files available in the market. Most of the times, when we come across eye-catching, pretty or cutely designed items, the quality is not always as nice as it looks; but when it comes to products from Mont Bleu, we can be sure that everything lasts long and is quality-made. The only disadvantage we had with these glass nail files is the squeaking noise that it makes when you start filing your nails since it does not produce the most pleasant sound when used. 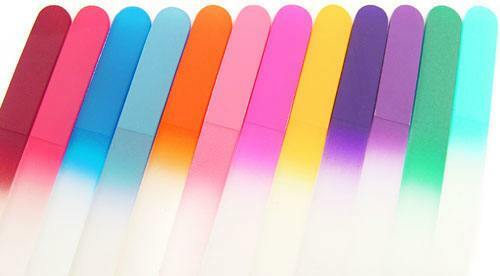 However, if you can easily ignore such sounds then there is nothing else to dislike about Mont Bleu’s glass nail files. If you want to know more information regarding the other products offered by Mont Bleu, you can simply check out some details on a Montbleu.com review or go straight to their website. However, if you wish to learn more about the glass nail file, read through our glass nail file review to find out just how amazing this item is. When you are planning to purchase a special gift for your family and other female friends, choosing the best present for them can become a time consuming and tedious task. The items need to appeal to them and also should look really pretty and stylish for them to love instantly. Every female wants to have items that they own which look beautiful, stylish, appealing, yet easy to bring around in their little containers. So if you want items that are quality-made, durable, fashionable, stylish, and very eye catching, then Mont Bleu’s products will be the wisest and most excellent choice for you. Always keep in mind that excellent and safe beauty items are a must for every woman, and all these beautifully made items such as nail and foot files, mirrors, and more, are available in Mont Bleu’s online shop. So if you need to find a really beautiful, stylish, and classy gift item, look at Mont Bleu’s online shop and marvel at all their wonderfully made products. Akop Nikogosyan – a designer from Prague, has founded the company Mont Bleu; Nikogosyan has been working with glass for thirty years and came up with the idea of these glass nail files. 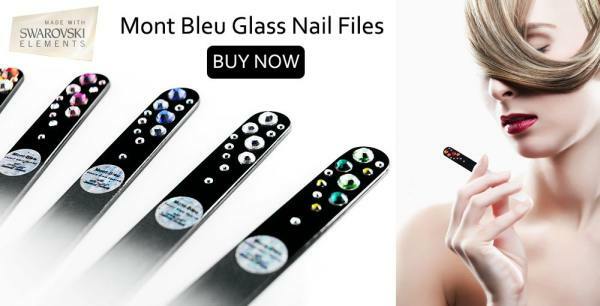 If you read another glass nail file review, you will learn that Mont Bleu produces beautifully designed crystal glass nail files while also decorating a variety of high-quality items such as glass foot files and compact mirrors. Mont Bleu – a company based in the Czech Republic, has gained notoriety for being the sellers of the best and quality-made glass nail files in the market today. 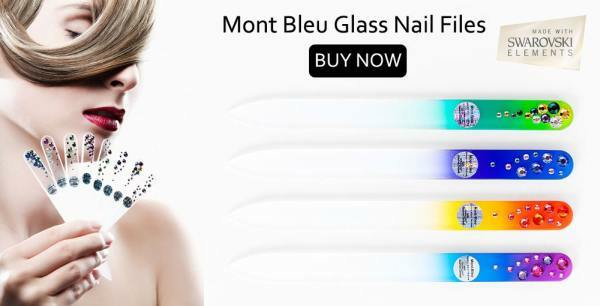 Mont Bleu – a company based in the Czech Republic, has gained notoriety for being the sellers of the best and quality-made glass nail files in the market today. Whenever your nails need filing, these finely made, clear or colored glass files from Mont Bleu will definitely do the job for you; they’re handy items that you can easily keep in your purse, or any container with limited space. 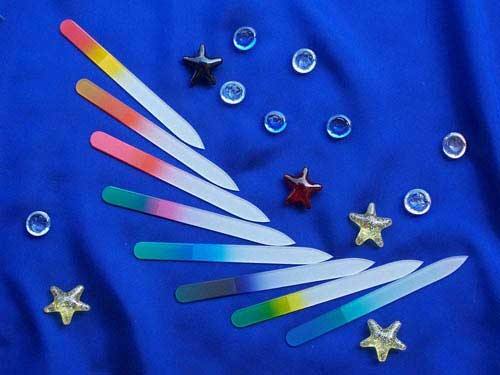 In addition to this, these glass nail files can be exhibited and sold in arts and crafts shows, retail stores, and even gift shops around. These nail files are transparent and come in various designs, styles, and even colors, plus, they come in their own cases and velvet pouches as well. 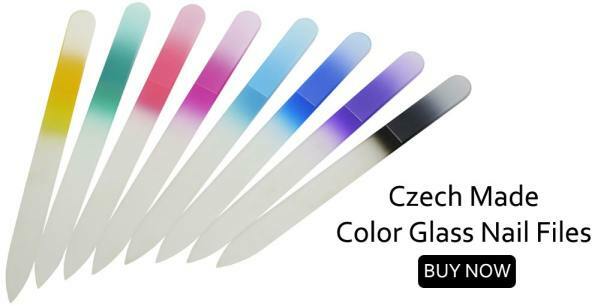 The nail files are made with quality-Czech tempered glass that lasts if not a long time, forever. Women and even men will love the classy look of these nail files that are not plain and boring compared to the usual nail files sold in the market. The company offers a three-piece set which includes an on-the-go nail file, one for use at home mainly for pedicures. All these three pieces are embedded with Swarovski crystal designs near the handle which makes this piece a really beautiful and stylish one. The quality of this product is beyond astounding; it’s filing surface is fine yet very sharp, so with one swipe, you can easily and completely smooth out the rough edges of your nails. To add to the fashionable class and style, these glass nail files come with a velvet sleeve that’s very nice and soft to the touch, but strong and durable which does not break easily. As for the nail file itself, it has a nice hold to it which is comfortable without you having to worry about it falling every now and then. To add to that, the file’s gradient provides an attractive effect plus the accompaniment of crystals gives it a gorgeous style. Our hands and fingernails are not the only ones that require attention and care, but our feet and toenails require such treatment as well. Mont Bleu actually considers these requirements and needs which is why they have created a product that can provide care for your feet and toenails as well. With their foot files and callus removers, the company offers a complete foot care package that includes toenail files and foot scrapers. The foot scrapers available in Mont Bleu works effectively by removing the hardened calluses and skin on your heels without leaving your skin damaged. This is considered the best alternative to your old metal scraper or pumice stone because glass scrapers are durable and long-lasting, plus these are extremely hygienic as well. Both the callus remover and foot files are created of Czech tempered glass which can be safely sterilized in an autoclave with boiling water. 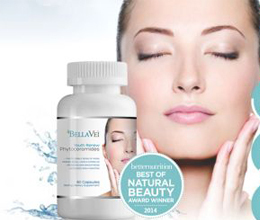 With Mont Bleu’s products, you do not need to worry further about cuts, dry skin, and expensive visits to the salon where the chances of getting infections are high. Mont Bleu’s foot files are generally made for pedicure and foot care procedures such as removing hardened skin from your soles. Its durable glass surface carefully removes the excess skin without leaving any cuts like most pumices do. After using this, you will feel that your soles are smoother and softer, making it feel like you have gone to a foot spa where you had your feet pampered completely. Another notable thing about these foot files is that the glass scrapers are strong and durable which will last longer because of the life-long polishing surfaces. The glass foot file, on the other hand, is made especially for your toenails to give them a nice and smoother shape compared to other foot files. You will be able to carefully shape your nails perfectly and at the same time, prevent any unwanted cuts while using the item. Furthermore, since the foot file is highly durable and reliable, you can keep it clean by washing or boiling it without the items cracking or breaking because of the increased temperature. Glass foot files are similar to the glass nail files since they are transparent, decorated and colored as well. It is also possible for you to choose your special set of items that you can send as gifts during birthdays, holidays, or any special occasion. If you want to give priceless gifts that are quality-made and designed beautifully, then these originally designed compact mirrors are the best choice. Based on various comments regarding the items made by Mont Bleu, these mirrors are rated as the most popular gifts for bridal showers. However, even if these are a hit for such occasions, the mirrors of Mont Bleu are perfectly designed for any type of style or occasion; whether it is something classy, glamorous, fun and exciting, you will find something that perfectly fits your style. These mirrors are also decorated with Swarovski crystals and are highly recommended for women who appreciate the mix of femininity and toughness for designs. There are two available shapes and these are the round and square mirrors; also, there are three color variants which are matte, shiny metal, and the classic black. These are still designed with Mont Bleu’s signature Swarovski crystals which make these a great addition to your collection or choice for gifts during special occasions. These mirrors come in beautifully designed decorative patterns like the sun, stars, flowers, butterflies, and a whole lot more. Women will surely love the fashionable designs and how easy it is to carry these compact mirrors in their pockets or purse. All of the products created by Mont Bleu are made from original and quality Czech tempered glass, and are hand painted as well as decorated with beautiful Swarovski crystals. There is a wide range of designs available for you to choose from and also, these items come in different sizes. Because they use high-quality glass and Swarovski crystals for their products, Mont Bleu’s items are durable, strong, and long-lasting which is why their products are considered one of the best ones available in the market. If you are searching for nail files that are decorated with beautiful and artistic designs, the hand painted glass nails by Mont Bleu will be the best choice for you; a highly attractive and useful item that will be great for gifts or for your personal beauty collection. For all these years, Mont Bleu has been providing you with only the best and finest quality products that you can ever imagine. Keep in mind that their products are made from the finest Czech tempered glass; Czech Republic has been the leading producers of glass by using the oldest practices and tradition for creating such quality items so you can be sure that the products coming from Mont Bleu are long-lasting, durable, and reliable. All the crystal nail files from them are available in three different sizes and also come in different varieties of packaging choices. These are not the only products available because Mont Bleu also has tweezers, mirrors, and glass foot files that are all embedded and designed with Swarovski crystals. 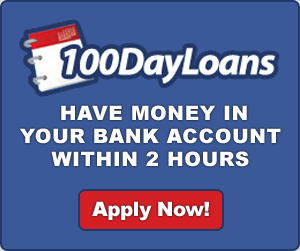 The company offers a large variety of quality products all over the world which is why clients from Asia, USA, Canada and others constantly purchase the products available. To cater to individuals who shop mostly online, Mont Bleu has opened their e-shop so everyone can purchase their items online to make shopping easier for them. Keep in mind that the company only wants to provide 100% satisfaction to their customers, so if you are not happy with the item that you purchased, they will give you a refund once you return the product within the given time period. 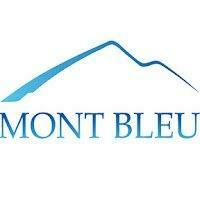 Aside from that, Mont Bleu provides full security and privacy when it comes to their customer information. The glass nail file makes an irritating squeaking sound once you use it to file your nails. It may become a nuisance to some people.